Flirting with Flowers, Part II: Bring on the Bulbs! Soon, soon the dutch iris will follow, along with the tulips. The forsythia is about to burst—and then the peonies should begin emerging. All of these are perfect additions to a cutting garden. Excuses aside, it's time for me to get back to the cutting garden—or there won't be any flowers to cut! One of the biggest challenges we face in our garden is my nasty nemesis...the vole. Although our cats used to do well with vole control, they're getting a little lazy. (Too many treats from the kids, I think, is ruining their hunting appetites.) To help ensure that our bulbs don't became a gourmet treat for the voles, I add sharp gravel into each hole or trench that I dig for bulbs. Years ago, when battling voles, I read that they won't cross over sharp stones. Since other remedies like bobcat urine didn't work (it was like putting salad dressing on the bulbs), I tried it. Surprisingly—we rarely lose bulbs to voles now. Also, lining a bed with wire mesh works well, a fact I wish I had remembered when constructing our raised beds. I've lost several Swiss chard and bok choy plants to voles this winter. Take a little extra time to protect your bulbs before planting. You'll be so glad that you did. From giant globes to small, clusters of flowers, alliums add drama to arrangements and visual interest to gardens. Also referred to as Ornamental Onion Flower, most alliums are a shade of purple, but some are also pink, white, or yellow. I've never grow alliums, and I'm excited to try them in the cutting garden—but I may also add a few to the front bed for visual interest. Alliums multiply rapidly, do well in poor or dry soil, and can grow in full sun or shade. Plant the tall varieties in an area protected from wind so that the stems don't break. Use: Blooms late spring, early summer. Harvest when 1/3 to ½ of blossoms are open. Be careful not to bruise the stem, because it will release an onion scent. Vase life: 10 days to 3 weeks. Is there anything happier than when the daffodils pop up in the bleakest part of winter? With literally thousands of varieties to choose from, you could have an entire cutting garden filled with just daffodils. The large yellow varieties are most popular, but shades of yellow and white with green, orange, or pink highlights are also available. Plant daffodils with other bulbs in the garden. 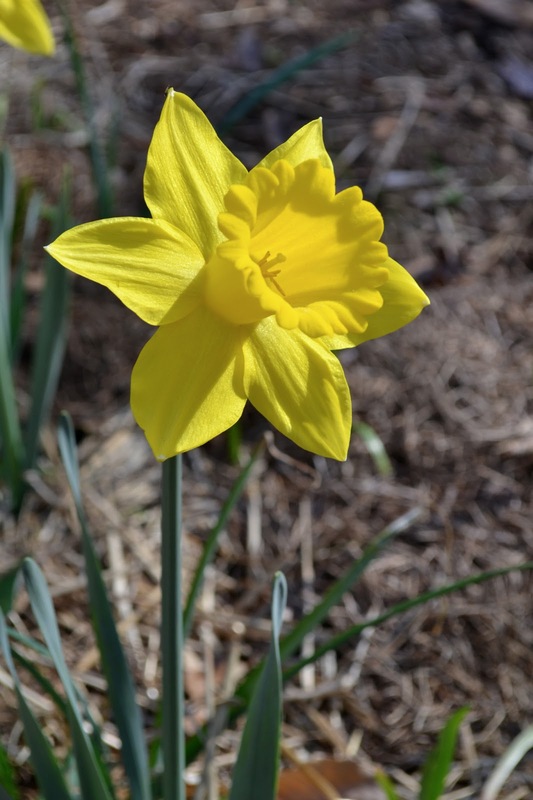 Daffodil bulbs and flowers are poisonous and will deter animals from eating your plants. Uses: Blooms mid-winter, spring. When harvesting daffodils, only pick the flower, not the foliage. Allow the leaves to die back completely in order to nourish the bulb for next year's flowers. Harvest daffodils at the bud stage, and don't cut—instead, pinch the stem at the base with your fingers. (This was new to me!) Pinching partially closes the stem and helps inhibit the latex serum from contaminating the water. The blooms will then last longer and can be mixed with other flowers in bouquets. Otherwise, only include daffodils in the vase. You can also condition daffodils by adding a drop of bleach in the vase and allowing them to stand for 24 hours before mixing with other flowers. Vase life: 3 to 5 days. I've never grown dahlias. I don't know why. Every time I look at the arrangements made by Erin at Floret Flowers, I drool over her dahlias. So, this is the Year of the Dahlia for my cutting garden! With more than 28 species, hundreds of varieties, and every color imaginable (except true blue), I'm not sure where to begin...but it will be fun selecting some tubers for the garden. Uses: Prolific bloomers, dahlias produce many flowers throughout summer into fall. They are frost sensitive, though, so you must dig up the tubers before the first frost and store until the following year to replant. Harvest when ¾ of the bloom is open. Dahlias last longer in arrangements if the foliage is removed. Vase life: 5 days. I tried to grow freesia a few years ago, not realizing that it's a bit temperamental. It likes strong light and cool nighttime temperatures, which is tricky in South Carolina. Still, just for the fragrance alone, I'm going to give it another try. Uses: Blooms spring, early summer. Harvest in bud stage, with only the bottom blossom beginning to open. Available in all colors except true blue. Vase life: 5 to 7 days. The wide range of fritillaria provides unexpected colors and textures in bouquets. From Fritillaria imperialis with its large cluster of hanging bell-shaped blossoms to Meleagris with its small, checkerboard pattern, fritillaria provides unique additions to arrangements. Some varieties, like imperialis, have an unpleasant musky scent. Uses: The bulbs are poisonous and provide good pest control in the cutting garden, and the musk odor of some varieties also repel pests. Used primarily as an accent in arrangements. Blooms in spring. Harvest: imperialis variety—harvest when most of the flowers are open. Meleagris variety—harvest when blossom is just beginning to open. Persica variety: harvest when ¾ of blossoms open. Milkowski variety—harvest when all blossoms are open. Vase life: Imperialis variety: 7 days; Meleagris and milkowski varieties: 3 to 5 days; the persica variety, 5 to 7 days. Who can resist the fragrance of hyacinth? These little cuties perfume the entire dining room and entranceway—but it's not an obnoxious, overpowering scent. It's a promise of spring-scent. I've also planted them right outside the front door. Still, while I've used them for awhile in the beds, I've never cut them for a bouquet—I never wanted to sacrifice the fragrance in the garden. If I can keep myself from forcing all of the hyacinth bulbs I bought, I should have a few to add to bouquets this year. A couple things to note: hyacinths are poisonous. Wear gloves when handling them, because their latex is also poisonous. Also wear gloves when planting, as the bulbs can cause an itchy reaction in some people. 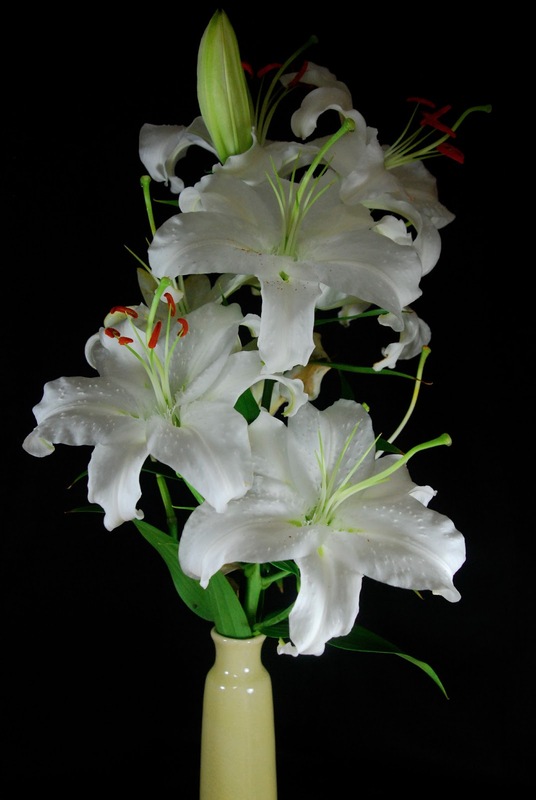 Uses: Spring blooms become more fragrant as florets open. Harvest when most of the florets are closed, and cut the thick, fibrous base to allow water to penetrate the base. Vase life: 7 to 10 days. As much as I love tulips, Dutch irises steal my heart. There's something about their deep colors and contrasting stripes that just make me happy. I like bearded irises, Siberian irises, and cute little Iris reticulata, too...but Dutch iris are the ones going in my cutting garden. Uses: Irises multiply rapidly and need to be divided about every three years to continue flowering. Harvest irises when they are in the bud stage, checking to ensure the bud is firm. Blooms in spring. Use as a focal point or an accent in arrangements. Vase life: 3 to 5 days. I love lily of the valley. Love it. I dream of little tussie mussies filled with these sweet blooms. You'd think with our shady yard that we'd have dozens of bouquets filled with lily of the valley—but no. A few stray blooms here, a few there...that's it. Somehow, I'm going to figure out the secret and try again. These won't be in the main cutting garden, since it's located in full sun, but I WILL grow enough of these adorable little flowers to make a bouquet. I will! Uses: A staple of the perfume industry, a few blooms can scent a room. The plant takes awhile to establish and requires patience. (No kidding!) Blooms in spring. Harvest when most of the bell-shaped blooms are open.The stems of lily of the valley are connected and enclosed at the base of their leaves. Pull apart and recut the stems and leaf base before putting in water to make the bouquet last longer. Vase life: 4 to 5 days. Similar to peonies and camellias in bloom shape, each stem bears several flowers. Available in both single and double forms. My floral design reference suggests that the tecolate strain is the best variety for cut flowers, as it produces the largest flowers. Available in many colors, except blue or black, as well as variegated, which is called picotee ranunculus. Ranunculus are grown from tubers, which resemble claws. Soak the tuber for 4 hours before planting to make rooting easier. Plant with the “toes” pointing down. The plants prefer warm days, cool nights, and ample light. Uses: Harvest when the petals are cupping the middle of the flower and fold inward. The stems break easily, so handle carefully. Ranunculus are heavy drinkers—check the water level often. Vase life: 7 to 10 days. When I was fresh out of college, I worked at a publishing company. And I had the nastiest boss in the world. I'm not kidding. This woman took great satisfaction in humiliating the younger staff while she sipped her Simi chardonnay, smiling the entire time. She taught me so much—about the kind of boss I would never become. Anyway, after one of her many “coachings,” I cried. Seriously. I broke down and cried at my desk. Thus, the “traveling tulip basket” was born. My friend Katie, who also received the wrath of the witch, and I would leave tulips on each others' desk after a particularly nasty altercation. The basket was refilled with fresh blooms and left for whomever needed a bit of cheer after mentoring hell. We both adored tulips, and we formed solidarity by surviving a truly bad boss. The tulips on the desk did more than just brighten a gloomy office. Somehow, it felt like we were defying her, refusing to let her crush our spirits. No matter how badly she treated us, we could rally and enjoy something as simple as fresh, innocent flowers. Wow. Just remembering those days is making my blood pressure rise! With dozens of divisions and hundreds of species, deciding on varieties for the cutting garden is tough—I'd like a few of everything, please! French tulips are taller and last longer in a vase than Dutch tulips. Uses: Because of the short bloom time, plant a mix of early, mid, and late blooming varieties for continual spring blooms. Most tulips need refreshing after two years, as their blooms become smaller. Harvest when the bloom is a large size and feels firm. Check inside the blossom to make certain no pollen has developed. Make sure to leave plenty of room when arranging. Tulips continue to grow and move in the vase. They're also thirsty, so check water levels often. Vase life: 5 days. French variety lasts 7 days. I'm so happy when I see tulips at the grocery store in January. I know they're not local, but a pretty bunch of tulips for $6.99 goes a long way to brightening my day. And it always makes me think of my friend, Katie, and how grateful I am that we survived the witch! You know, I think I need to go to the grocery store before the mad Valentine's Day rush begins and buy myself a bunch of tulips. Stay tuned for Part III...shrubs for the cutting garden. Now, quick! Go buy yourself some tulips! You deserve it!